= Mado ga akete aru kara soto ga yoku mieru yo. = The window has been kept open so I can see outside very well. = Ah, asoko ni inu ga iru! = Oh, there is a dog over there. = Kyou wa beddo meikingu ga mou shite attayo. = Bed has been already made for today. Hi everyone! How have you been? Today’s guest teachers are Shadow Sensei and Chibi Sensei. Chibi Sensei became an angel when she was 22 years old. She is missed most deeply by the whole family. Now she can teach her dad Japanese from Cat Heaven. And Shadow Sensei is a big cat, and according to his dad, he is afraid of doorbells, sneezes, thunder, and strangers. He also seems to have a special affection for shoes and dirty clothes. Those are his favorite sleeping places! He is a wonderful, temperamental, neurotic feline that gets depressed when his family goes away. Although, he does come when called by mom, studiously ignores the rest of the family. I love all these cute anecdotes. So today these two lovely cat teacher have gotten together to make this lesson for us. = Shadow Sensei, Chibi Sensei junbi wa ii? = Shadow Sensei and Chibi Sensei, are you both ready? = Hajimemashite Shadow to Chibi desu. = Hello, Nice to meet you! We are Shadow and Chibi. = Kyou wa issho ni minasan ni “~tearu” no tsukaikata wo oshiemasune. 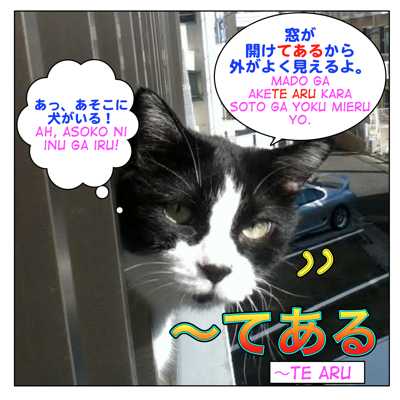 = We will teach you how to use “~ te aru” today. In the previous lesson, Max Sensei taught you how to use ～ている ( = te iru). Someone asked us the difference between ～ている ( = te iru ) and ～てある ( = te aru ). 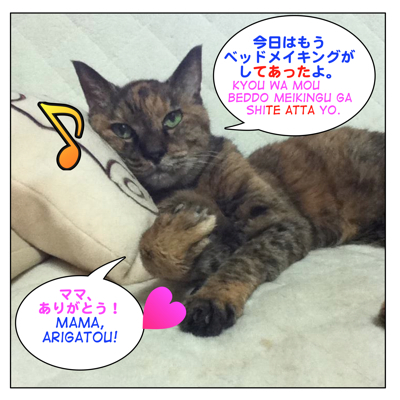 Maggie Sensei made a lesson on the difference between いる ( = iru) and ある ( = aru) in this lesson. Then what is the difference between 〜ている ( = te iru) and 〜てある ( = te aru)? Let us teach you the basic difference first. but you only use ～てある ( = te aru ) with transitive verbs. = The light is on. = Denki wo tukete iru. = Denki wo tsukete iru ie. = The house with lights on. 2) While 〜ている ( = te iru ) is used to describe ongoing action or a current state, 〜てある ( = ~ te aru ) is used when the result of an intentional action still affects the current state or the result exists until the moment when the speaker describes it. It just describes the current state which is “the window is open”. = Mado ga aite iruyo. = The window is open, you know. = Kuuki wo irekaeru tame ni akete aruno. = I have left it open to change the air. = Itsumo saifu no naka niwa ichimanen satsu ga haitte iru. = There is always 10,000 yen bill in the wallet. In this sentence, you just describe the simple state of the wallet which has 10,000 yen. = Itsumo saifu no naka ni wa ichiman en satsu ga irete arimasu. You can use てある ( = te aru) for your own intentional actions as well. = Yuushoku wa mou tsukurimashita. = I (have) already made dinner. = Ie ni kaettara yuushoku ga tsukutte atta. = When I got home, the dinner was already prepared. = Yuushoku wa mou tsukutte arimasu. = Shukudai wa mou yarimashita. = I have already done my homework./ I did my homework already. = Shukudai wa mou yatte arimasu. = My homework has been done already. = Kyou wa beddo meikingu ga mou shite atta. This sentence doesn’t specify who made the beds. So we use てある ( = te aru) when some action is done on purpose and you see the resultant state when you talk about it. We will show you lots of examples so hopefully you can get the idea. Note: Please know that the translation of てある ( = te aru) in English is not consistent because if I translate it directly it may not sound natural. I translate it in various ways in hope that it helps give you the sense of how it’s used. ★Describing the resultant state that someone has done something (intentionally). = Ie no mae ni ookina kuruma ga tomete aru. = There is a big car parked in front of the house. = Kore nante kaite aruno? = What does this say? = Arigaqtou tte kaite aruyo. = Yoru wa iriguchi ga itsumo shimete arimasu. = The entrance is always kept closed at night. = Kono mise ni osake wa oite arimasuka? = Do you have alcohol in this store? = Max kara kita ehagaki niwa kireina kitte ga hatte atta. = There is a beautiful stamp on the postcard from Max. = Kabe ni posutaa ga kazatte aru. = They have a poster on the wall. = Kagi ga kakete atta kara hairenakatta. = The door was (has been) locked so I couldn’t get in. = Kyou no karee wa itsumo yori karaku shite arimasu. = Fuyu nanoni danbou ga kitte aru. = The heater has been turned off even in winter. ★When you have done some preparation. = Kae no denkyuu wa itumo katte arimasu. = I always buy spare light bulbs and stock them. = Hozon shite atta deeta ga subete kiete shimatta. = All the data that I have saved is gone. = Maggie Sensei niwa mou renraku shite arimasu. = I have already contacted Maggie Sensei. = Jizen ni yoyaku ga shitearu hito dake ga hairemasu. = Only a person who has made an advanced reservation can enter. = Chiketto ga katte aru. = Chiketto wo katte aru. = The video tape recording has been done/ to have set the video tape recording. = Rokuga wo shite aru. So there. Hope our lesson help you understand how to use てある(=tearu) more. = Are? Kokoni miruku ga oite arukedo dareno? = Hmm? There is milk sitting here but whose is it? = Shadow Sensei, Chibi Sensei ressun, arigatou! = Thank you for your lesson, Shadow Sensei and Chibi Sensei. = Sokoni oite aru miruku wa Shadow Sensei to Chibi sensei no dayo. Yukkuri nonde ittene. = The milk which is sitting there is for you two. Take your time and drink it before you leave. Thank you so much for all the detailed explanations of this and many more topics, it really helps me to understand crucial grammar points much easier. I finally have a general understanding of when to use the ～てある grammar. But I still don’t get the difference between ～てある and ～てあった. Sure, I know the latter one is in the past tense but I struggle to understand when to use ～てある and when to use ～てあった. 昨日、お茶が作ってあった。Yesterday, the tea has been prepared. I think your interpretation is right. Let me add one thing. お茶がつくってある You are looking at the tea which someone prepared. お茶がつくってあった You are talking about the tea which someone prepared. The tea doesn’t have to be in front of you. thank you for taking the time explaining that to me. It’s actually not that hard to understand but the more time I spent on this grammar point the more I got confused… By now I’m used to the ～てある grammar point. No problem! Now you need to practice! 電気をつけている家 “the house with the lights on”. You can’t tell by the translation but there is a hidden subject. Therefore it’s a transitive verb. You just describe the state of the house. 今日はベッドメイキングがもうしてあったよ。 You are already in the bed or telling someone that you saw someone made a bed for you. 今日はベッドメイキングがもうしてあるよ。 You are not in the bed yet. You are looking at the clean bed. or if might be also used if the speaker is attempting to say he enjoyed\ did something through what other people have done. Shall I say this only if I\someone is eating it right now? Or if someone ate it as well? 10年前あそこに車を停める。 The car was parked 10 years ago and its still there. 10年前あそこに車を停めてあった。When the speaker saw the car,it has been parked there for 10 years already. The current state of that car is unknown. てある・てあった　expresses someone did something (and leave it) for someone on purpose. The speaker is aware of something through whatever was done by others. As you say we can usually tell the speaker enjoys the state/enjoyed doing something but てあった doesn’t always mean that the speaker enjoyed doing something or not. It could just describe some state which has done by others. = Ie ni kaettara ryouri ga tsukutte atta keredomo onaka ga ippai datta kara tabenakatta. = When I got home, I saw the food prepared for me but I didn’t eat it because I was full. = Teiburu ni Rikon todoke ga oite atta. – I Want To Ride A Bike. – I Want To Go To Japan. – I Want To Be A Writer. WHICH ONE IS THE CORRECT, Sensei?! Jitensha ni noritaku te = this “te” gives a reason. I want to ride a bike and do something in order to ride a bike. Ah good question. I should have included the information. You also might see てない. It is a casual contraction and you drop い in conversation. Would you like to check this lesson? I made this lesson a long time ago. Thank you for spotting the typo. I fixed it. Really appreciate it. I don’t get why you dont use tearu for when you are wearing things,the verbs of wearing are obviously transitive and you put clothes on on purpose and keep wearing them. describe the state of the person who wear those or will of the person who is wearing those. It doesn’t matter who did/does it. You describe the result of an action (putting on). Sono jidai ore ga kaetearuyo. Orega hokage ni nattekara, hyuugawo kaetearuyo. Keep in mind all of these actions have not happend yet. They are both referring to the future. = Ore ga kaete yaru yo. I realized that instead of ある、 you have used あった in this sentence, 今日はベッドメイキングがもうしてあったよ。But the way i intepreted it, it is no different than ある. We all know that ある is the present form as such, we can understand that the Bed has been already made for today (Since the state is there after bed making). Hence, what i could interpret it my way is that the state may no longer be there when we use あった instead (It could be there somebody went to the bed and we do not know or such). May I know why is that so? Would appreciate it if you can show me an example in both its present tense and past tense may help me to understand better in this matter. You are already in the bed or telling someone that you saw someone made a bed for you. You are not in the bed yet. You are looking at the clean bed. I just found your website a few days ago, and I really like it! It has been very helpful to me, and I love the animals you bring on to give the lessons. This post reminded me of my own sweet kitty Minky, whom I had for more than 15 years. She became an “angel” two weeks ago. Welcome to Maggie Sensei’s site! Sorry to hear about Minky. I am an Angel, too, you know. I will show her around here if I see her around. Without seeing the translation that you wrote, I’m sure I’d have translated something like “The house that it’s turning the lights on” lol Why the -te iru here? Since it’s transitive and when I see a transitive with -te iru, I understand an ongoing action by the subject, so I don’t get the use of “te iru” there, instead of “denki ga tsukete aru ie” (on purpose) or more stative ” Denki ga tsuite iru ie” , the house with lights on (by themselves). What is the difference? The literal translation is “The house which is turning the lights on” But since the subject is a house, it will be more natural to translate “The house with lights on” So your interpretation is correct. Oook, so, I see it’s more up to the context. Sometimes your omitting things confuses me hahaha. Thinking about it as “The house whose owners have switched the light on” makes much more sense to me, but I guess it’s unnecesary to specify “juumin ga denki wo tsukete iru ie”. I think that I sometimes overexplain things when I’m talking japanese, because I’m afraid of saying something awkward, but then I see you Japanese people are not that strict, and as long as it makes good sense you don’t mind it that much So it gives me more confidence. Thanks!! But yes, we omit particles, subjects and switching the order of words….In that sense, Japanese is not that strict languages. この映画はもう　見てあります。。　sounds so odd. There are some other transitive verbs that just sound odd used with the てある form… Is there a rule to this? I have seen this movie already. As you said 見てあります sounds odd because you don’t usually see a movie to prepare yourself. You usually use てある when you do something intentionally to prepare for something. So この映画はもう見てあります only works for example you are a judge of some movie contest and you have to see a lot of movies to attend the contest. Hi Maggie sensei, i wanted to ask you, what does “mou” means before verbs. = Sore wa mou owarimashita. = It is already over. = Kare niwa mou aimeasen. = I can’t eat anymore. “考えてる暇”はない but there could be some other time to do something else. お母さんは”そんなに厳しいわけ”がないでしょ？stressing “there is no way to be so strict”. Hello Maggie! Thank you very much for this interesting lesson. I’m not entirely sure, if I understand を＋動詞～て形＋ある correctly. Does it imply that not someone else but the speaker himself has done some kind of preparations? The tickets have been / are bought [already] ==> Someone have bought them. It might be the speaker, but we don’t know that exactly. The fact is, that the tickets are bought. I have bought the tickets ==> The speaker have bought the tickets. I know that を＋動詞～て形＋ある is 正しい日本語, but for me it sounds a bit strange this combination of を and ～てある. チケットを買ってある the subject could be a speaker as well. I have already bought a ticket but I don’t know if I can go there or not. So I understand that in を…てある and は／が…てある the result we see could be caused by the speaker (ex. I) as well as by someone else. It depends on the context. I just answered your question on FB. Maggie Sensei, many thanks to bring to us this great lesson. Thank YOU for checking the lesson,too!! At the end of the lesson, you say that you can use てある when you have done some preparation. So… is it like ておく ? Or is there any difference ? Other difference between てある and ておく. You can’t use てある here. 2) You can’t use てある when you express what you are going to do.